Royal Pacific has increased quite a bit since I last stayed there 4 years ago. So much so that I probably would not stay there again with the increase in other on-site UNI options. I just checked Royal Pacific Florida Resident rates. There's no availability the week OP posted for anything below a king suite so I can't get exact numbers for this resort, but this is nearly half Disney's rates at Poly. Plus passholders get an additional discount of up to 20%. I stayed on property at Royal Pacific last July though and checking the invoice just now, I paid less than $275/night after discounts. 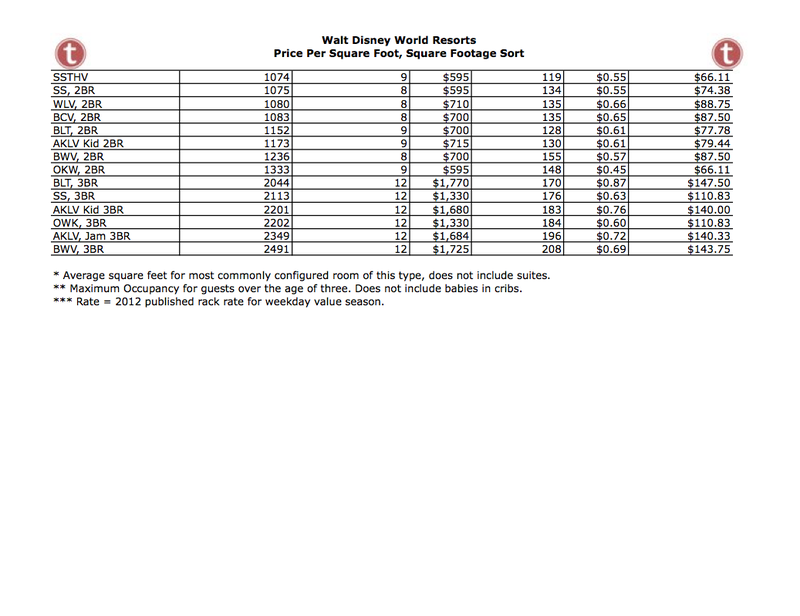 Actually, with Magical Express, EMH, package delivery and free transportation, the value resorts are some of the biggest hotel values in the country. I'd be shocked to see the two resorts offering the same rate. I love RPR, but the Polynesian has much, much larger standard rooms that can sleep 5 and a beach view of the fireworks. I was only speaking to Royal Pacific not being as expensive as implied, I wasn't intentionally comparing the two. You can technically have 5 in a standard queen room at RPR with a pull out, but I wouldn't recommend it. You're right that Poly's rooms are larger, their standard room size is 415 sq feet, where RPR's standard room is 335. 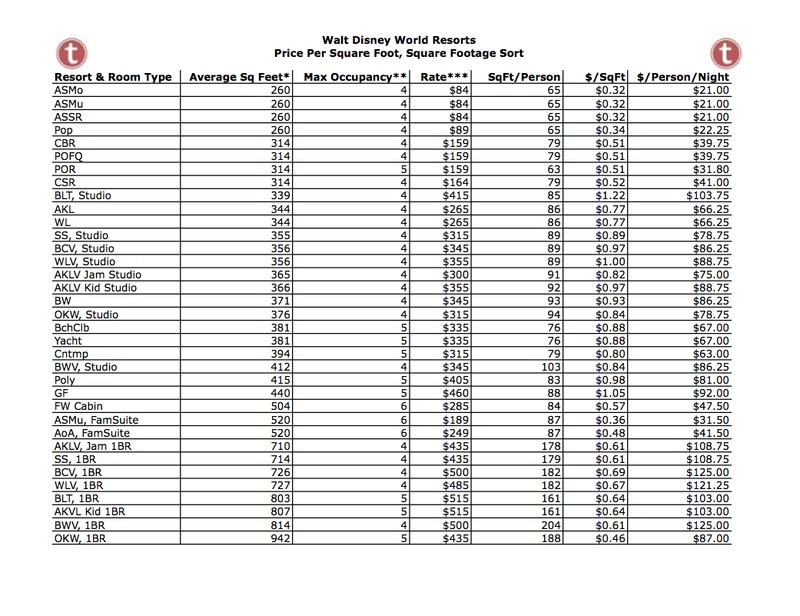 So how does the price per sq Ft work out for each resort ? That's largely irrelevant since you're going to make the choice based on the intended destination. I don't live in the USA at all, let alone Florida, so those rates are never valid for me. If I were to ever do 4 nights or more at UNI again, I would probably look into getting some kind of AP. So happy I bought the DVC 10 years ago. It was a smart move. Before that never stayed at the deluxe resorts. It's the only reason I can. Insane how much rooms are for cash rates! Almost nobody pays rack. Even with "free dining," the food serves as a discount. With a correlary, it is now insane how much money is leaving on the table with DVC. After initial buy in where WDW gets cash up front, every year there after for 40 years, a weekly stay at a DVC room returns at a daily rate of yearly maintenance fee/7. Which is much less than what the room can command on a cash basis. Thank you, I wasn't sure if you were saying the buyers somehow left money unaccounted for. Where did you own at? I own at BC and I always get a 1 bedroom, lately a 2 bedroom. funny because most folks have issues with getting studios because they are less points. anyhoo, I've owned since 2001 and never once have I not gotten my first choice at 11 months out and I've booked food and wine festival a number of times. let me say I usually go in May and late august/september. LOL, I just booked a 2 bedroom villa for the last week in August. Now the BC was sold out because of the start of the food and wine but I had the choice of 4 resorts. AKL (kidani), Saratoga springs, OKW and BLT's . I took the 2 bedroom at OKW because I'm taking 4 young adults and OKW has the biggest villas. I booked my trip in april. I took a look at the members website under the 60 day availability tool. quite a few resorts pop up including Poly and the Grand floridian. I will say that if you do not own at an Epcot resort food and wine can be a bear to get into during that time. I also looked into a trip the week of 1/19 (~ 8 months) every single resort except for the poly had a 1 bedroom. I'm leaning toward trying Wilderness lodge but will have to wait until next month as it's not my Home resort. I stayed in Grant Village. I booked about 6 months out. I wanted the old faithful inn, but we weren’t close to getting that. We also only got 2 or 3 nights in the Park. TThe other days we stayed in Jackson Hole - which is awesome too, and the Tetons have some great hiking too. We got to old faithful for an early eruption and it was pretty empty. We stopp d on the way back for lunch and it was packed. If you like wilderness lodge, you’ll love checking out old faithful inn. Good luck with the trip. I worked in Yellowstone NP for three years- most recently as a Front Desk Manager for the Old Faithful Inn. Feel free to reach out if you have any questions on where to stay. My biggest recommendations for in park reservations are to be flexible with location and always call in to reserve. The website for booking is terrible. I struggled with it even being an employee! But to your point, Disney is definitely not alone! When I was working at the Inn we had a range of rooms just under $300/night with no real view (unless you were first floor, then you got a lovely view of our loading area and employee dining room) and no recent updates. Due to being in a national park we also offered no tv or internet. These weren't our historic, original rooms either. Those were $100/night but generally did not have a private bathroom. But in either case you could leave the building and be at the Old Faithful geyser in less than 3 minutes or so. Location definitely costs you! I just had to like this as I worked front desk at Grant Village for a season and met my husband while I was there!